FROM $19/MONTH. NO HIDDEN FEES. NO CONTRACTS. Appointments, POS, online bookings, reporting, SMS & email marketing, 9 cent SMS, remote access, iOS & Android apps, all-device compatible, and so much more! From a single owner operated hairdresser or a multi-stylist salon, we’re all you need. From a nail salon to beauty treatments such as facials we’ve got you covered. From a simple massage to full fledge health, aromatherapy & relaxation spa, we can manage it. "I'm loving how easy the software is to use! A total business game changer!" "I had the whole thing figured out in no time. When I did have questions, I was beyond impressed with the turn around time response." "I seriously love this software. Explore all the facets of the software. I will bet you keep finding different things to utilse." "Holidaying in Fiji, sunbaking, iPad in hand - you get the picture - nice! 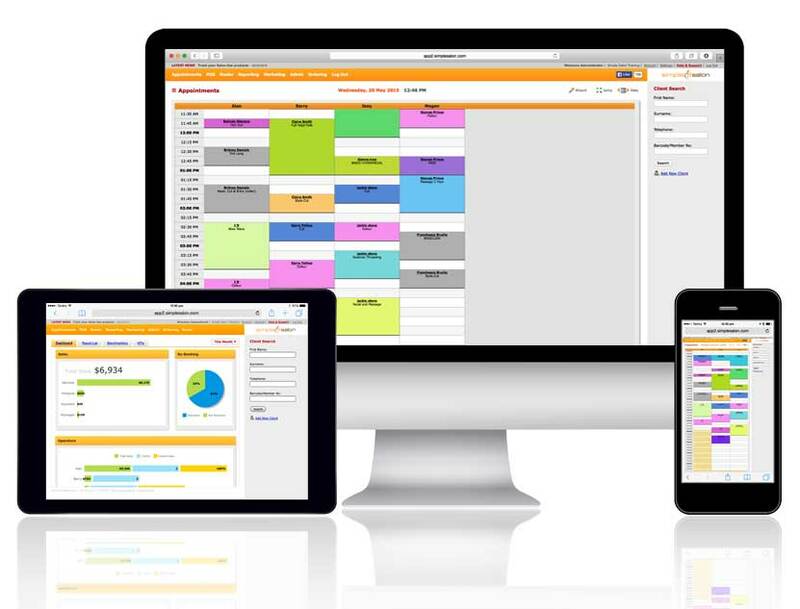 Simple Salon seamlessly manages your appointment scheduling, walk-ins, no-shows, rebookings, rooms & resources. Easily add multiple photos, documents and history notes to clients appointments. No more double entry required. With the Simple Salon and Xero Accounting integration, have your figures automatically sent from Simple Salon to Xero at the end of every day. No matter where you are, you can easily take, view or make changes to your bookings via the Simple Salon app on any smartphone and tablet. You can even add client notes or contact them directly. Sit back and relax with automatic SMS and email appointment reminders. When clients reply with the word Yes, the letter C will automatically display on their appointments. Comprehensive and easy to understand Dashboard gives you a visual cue of how well your salon and staff are performing with KPIs covering all the important metrics you need. Process all sales via the Simple Salon POS page. Record transactions as any payment type, even create your own custom payment methods. The POS also allows for deposits and laybys. Every Simple Salon customer gets an online booking mini-site. Embed it on your website or add your location-based online booking URL to your Book Now button on Facebook. From customised welcome messages to automatic re-book reminders, Simple Salon’s flexible and powerful marketing tool gives you everything you need to achieve automatic growth and success. Our team prides itself on providing free, prompt and friendly help and support. We also have an extensive collection of articles and tutorials in our Knowledge Base to ensure you can learn anything, anytime. "For anyone looking at cloud based salon software, I would recommend Simple Salon." "Simple Salon is very good salon software. I own 30 salons and it is magical!" "The online video tutorials are suitable for even the most technologically impaired (me)." No obligations or fixed term contracts. No sign-up fees. Start Immediately. Simply choose the package above that suits and fill out the form. We will create your Simple Salon account immediately and email you the details. Once the sign up form is completed we will process your payment and begin the monthly subscription. The monthly amount will automatically be debited from your credit card. Absolutely. Just say the word, and you won’t be charged again. We prefer happy customers rather than angry customers on long contracts. Still Not Convinced? Have more questions? Here are some of the most common questions… Answered! Can I transfer my data? Your data is secured and encrypted with the same technology used by banks. Focus on running your business and be confident that your data is backed up at all times. Can I use my existing device? You don’t need to buy any new hardware – Simple Salon runs beautifully on your PC, Mac, Laptop, Tablet or Smartphone. Of course you can. We have a great range of videos to get you started quickly and easily. However, if you would prefer a personal training session with one of our experienced team, we have the Online Training option available. Simple Salon works “in the cloud”. So nothing to install or keep up to date. Use Simple Salon from browsers such as Chrome, Firefox or Safari. Yes, you certainly can! We have an export feature built into virtually all our reports, so you can do the export yourself at any point in time.